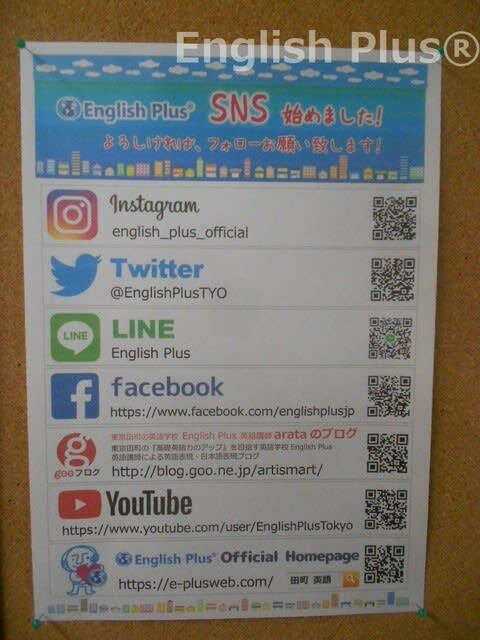 Today, I'd like to inform you of English Plus' SNS information. Since we started English Plus, we've made our official website, Facebook page, and twitter account. In addition to these, we just added our official Instagram to our SNS lineup. Also, for our students, we've recently made LINE account and so on. If you have chance, please follow us on these of our SNS accounts, and we'll be really happy. ・English Plus Official Twitter (https://twitter.com/EnglishPlusTYO). ・English Plus Official Website (https://e-plusweb.com/). If you have a chance, please visit and follow us. After you check some information and have a question, please ask us directly or through the website. Thank you for visiting our website in advance! 今日の英語での一言："Thanks for your time to visit English Plus' page!"